Don't forget to check your smoke-detector batteries, especially if you live in an area where the weather is clock-meltingly hot. I’ve been thinking a lot about Daylight Saving Time lately. Every year, I get the opportunity to travel back in time and relive an hour of my life, and every year, I squander it. I usually just sleep through the hour and then go back and sleep through it again — I might have slightly better dreams the second time around, but that’s hardly the kind of life-altering experience usually associated with time travel. This year is going to be different. This time, I’m going to go back and change something. I just haven’t decided what yet. The problem, of course, is scheduling. There are lots of things I’ve done in the past that I’d like to undo, or do differently, but it’s too late for them — I’ll only be able to go back that one hour, to 1:00 am on Sunday, November 6, 2011. If I’m going to make this time travel journey count, I need to plan to do something during that hour that has the potential to be either amazing or a huge mistake — and I’ll need to know which it is immediately, since I’ll only have an hour to decide whether I want to do something different the second time around. 1. Dye my hair a radically different color. This one is tricky, because there’s no possible way it will turn out well if I try to do it myself, and I’m not sure I’ll be able to get a salon appointment for 1:00 am. 2. Watch a TV show I’m not sure I’ll like. If it turns out to be really awful, and I find myself saying “I wish I could have that hour of my life back,” I’ll get my wish! 3. Try fugu. The logistics are a little complicated — I need to find a restaurant that will accept a 1:00 am reservation, and I need to time it so that if I eat a tainted piece of fish, I’ll be sick enough by 2:00 that I know I shouldn’t have eaten it, but not so sick that I’m already dead. If you’re turning back your clocks this weekend, I invite you to join me in doing something experimental during your trip back in time. Just don’t kill your grandfather. It won’t cause a time-travel paradox, but it’s illegal in most jurisdictions and really isn’t a nice thing to do. I can’t believe I’ve been missing out on this time travel opportunity my entire life. And I don’t even need a Delorean. Great. Now I have to think of something different for your birthday. My home town has the best way to deal with the time change EVER. The bars stay open until 5 a.m. and we have a big party. So I have spent many a time travel opportunity drunk out of my gourd. It makes adjusting so much easier. This Sunday is when Daylight Saving Time ENDS, though. What about that hour we hop into the future every spring when DST begins? You mean when we’re all abducted by aliens and experience the sensation of “missing time” for an hour in the spring? I’d rather not talk about it. Saw the original once. It blew me away. 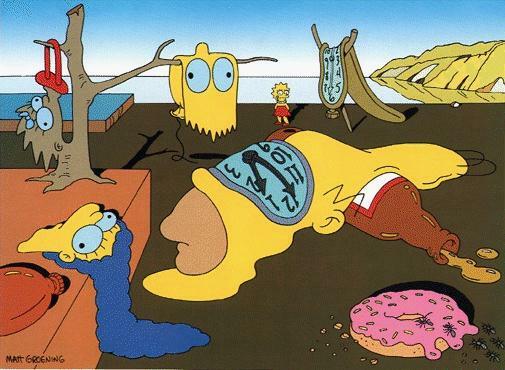 When I did an image search for this, I found a surprising number of Dali-esque melty clocks for sale. The only thing that’s preventing me from buying one is that there are so many to choose from. You sound nice. Wanna grab some fugu at 24 Hour Sushi tomorrow night? It turns out there’s a serious flaw in that plan: I usually get highlights, and that takes longer than an hour. I travelled back in time last week, and I’m still stuck there. Not in last week, but I’m still an hour out of time somewhere. This comment, for instance, hasn’t been posted yet, but by the time you read it, it will have been. Don’t you just love paradoxes? Have you read this comment yet? wait… I’m not sure that made sense. Going back in time to go back in time is like wishing for three more wishes. Now you tell me! It’s too late, but maybe next year I’ll take that rocket trip to the moon, and it if doesn’t quite go right, I can decide not to go the second time around. If I survive the first attempt. Remember, you can only go back in time an hour, so you’ll need a really fast rocket. I tried explaining daylight-saving time to a South African friend recently. Pretty sure she still doesn’t understand it. Can’t say I blame her. It’s just time travel and alien abductions — I don’t see what’s so confusing about that. This one hour back and then one hour forwards must be really confusing, thought the prospect of having an hour extra to sleep in sounds glorious! I’d probably just do that, anything else might make my inner sloth pout..and a pouting sloth isn’t a very pretty sight! The extra hour of sleep is really popular. Although I usually wind up staying up late the night before, so I don’t get any actual extra sleep. I went back in time and ate more s’mores, and yet my thighs still act like I ate double the amount of s’mores. BASTARDS!!! !